Researchers from the University of Southampton are developing colour changing and antibacterial textiles that will inspire wide-ranging functional materials of the future. The multi-disciplinary research which combines the Synthesis, Catalysis and Flow group in the School of Chemistry with the Smart Electronics and Materials (SEMS) group in Electronics and Computer Science (ECS) is investigating a new technique for achieving light emitting textiles which could be used in medical, performance sports, automotive, architecture and fashion applications. The new project, funded by the Engineering and Physical Sciences Research Council (EPSRC), is formulating light emitting films on the surface of standard textiles through electronically functional inks and spray coating, along with cutting-edge inkjet and dispenser printing processes. 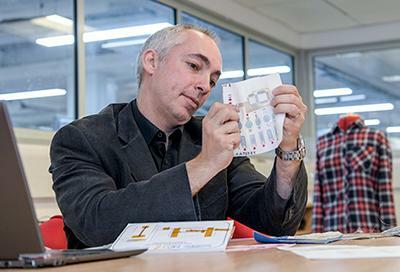 Co-Investigators Professor David Harrowven from Chemistry and Dr John Tudor from ECS are drawing upon their complementary expertise in the chemical synthesis of complex molecules and in e-textiles, printed devices, materials processing and formulation. The SEMS group at Southampton has coordinated two EU projects worth a combined €12m over the last nine years, integrating electronic and sensing functionality in e-textiles. Similarly, over the past decade the Synthesis, Catalysis and Flow group has been the primary UK partner on two EU projects worth €11m and currently leads the 2017 European Regional Development Fund (ERDF) supported LabFact project (€6m). In addition, the group leads the Innovate UK collaborative project Chemo-enzymatic Production of Specialty Glycans (£3.5m) and is a partner on the EPSRC Programme Grant Photo-Electro: Transforming Chemical Synthesis, Discovery and Manufacture (£6.5m).